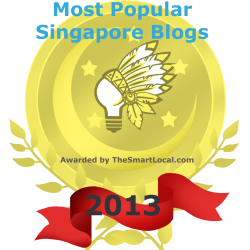 Over the last few weeks, I have written a few articles for The Real Singapore, also after I received unverified threats to my family and stopped writing on this blog for a while. I have compiled some of the key articles in this article here. These articles will outline how the policies that the PAP has created have not helped Singaporeans, and how the opposition parties do have credible policies that can take care of and protect Singaporeans. “The income inequality in Singapore is also the highest among the developed countries. The rich-poor gap in Singapore is also the highest. Even though Mr Lee earns $2.2 million in a year, a cleaner can still only earn $1,000 a month. It will take nearly 300 years for a cleaner to earn the total of what Mr Lee can earn. In recent times, the Singapore government has also increased their own salaries in 1994, 2000, 2004 and 2007 and each time, the income inequality rose with it, followed by the rich getting richer as the share of income that goes to them also increased. Mr Lee said that ministers should be treated “fairly and equally” but this comes at the expense of Singaporeans who are treated unequally. 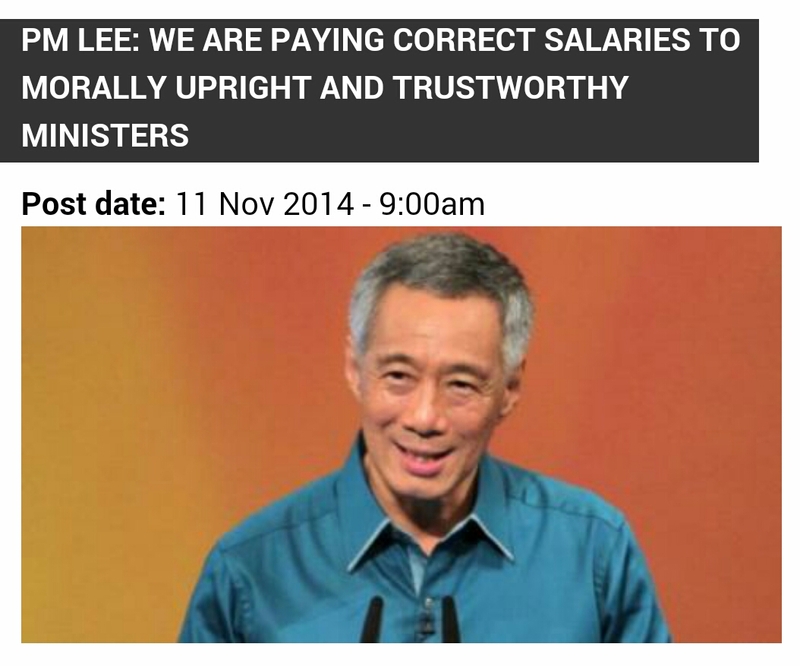 However, the question has been often asked, if we need to pay office-holders such extravagant salaries to prevent them from being corrupt, then are they even “morally upright” and “trustworthy” people in the first place, as Mr Lee claimed? “The problem is compounded when the rich in Singapore, the government among them, earns the highest salaries among the developed countries and one of the highest in the world, while ordinary Singaporeans fall on the other end of the spectrum and earn one of the lowest. 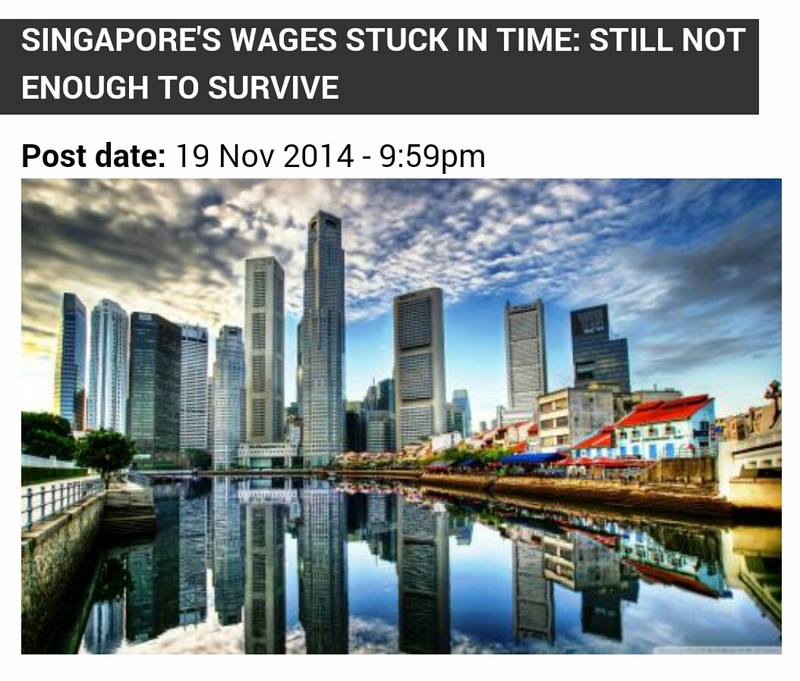 This has caused the rich-poor gap in Singapore to be the widest among the developed countries. So is the income inequality and poverty rate the highest. The situation has become very unhealthy in Singapore where the purchasing power in Singapore is now the lowest among the developed countries and on par with even India, even as Singapore has become the most expensive city in the world. The government has shown bravado every time it wants to increase the salaries of the ministers but when it comes to increasing the wages of Singaporeans, the government has come out with every excuse, such as having to peg wage growth to productivity growth. But where productivity was zero last year and negative the year before, this means that the wages of Singaporeans are put at risk. It is high time the government stops making excuses and take definitive and bold action to increase the wages of Singaporeans, especially for the low-income, by imposing a minimum wage. “However, not only has the income inequality in Singapore grown to become the worst among the developed countries, it has also become one of the highest in the world. Trickle-down economics never happened. In fact, the rich-poor gap in Singapore is now the widest among the developed countries. The rich in Singapore are the highest-paid among these countries while Singaporeans earn one of the lowest wages. Meanwhile, the PAP ministers continue to pay themselves the highest salaries in the world and have fought consistently to raise their own salaries. However, they have never taken the effort to do the same for Singaporeans. Today, Singaporeans are forced to accept one of the lowest wages among the developed countries in a country where the cost of living has become the highest in the world. “However, all these promises have not been fulfilled. Latest statistics show that BTO flats are still priced higher than four times the median salaries of Singaporeans. For three room flats, prices are 4.57 times that of applicants’ annual salaries. This is even higher for four- and five-room flats. Prices of four-room flats are 5.26 times that of annual salaries and for five-room flats, this is 5.36 times. But last year, the price ratio was already about 5.5 times that of annual salaries, which means that things have remained largely unchanged. Also, Mr Khaw promised that flat prices will be reduced to four times that of annual salaries but the prices are still way above the mark. Not only that, the government has also broken its other promise of increasing the number of flats available for Singaporeans. In October, the government announced that it will be reducing the housing supply next year. Mr Khaw said that the number of BTO flats to be launched next year will be reduced by 25 percent, from 22,400 units this year to 16,000 units next year. But already, the 22,400 units launched this year is already lower than last year, by 10 percent. 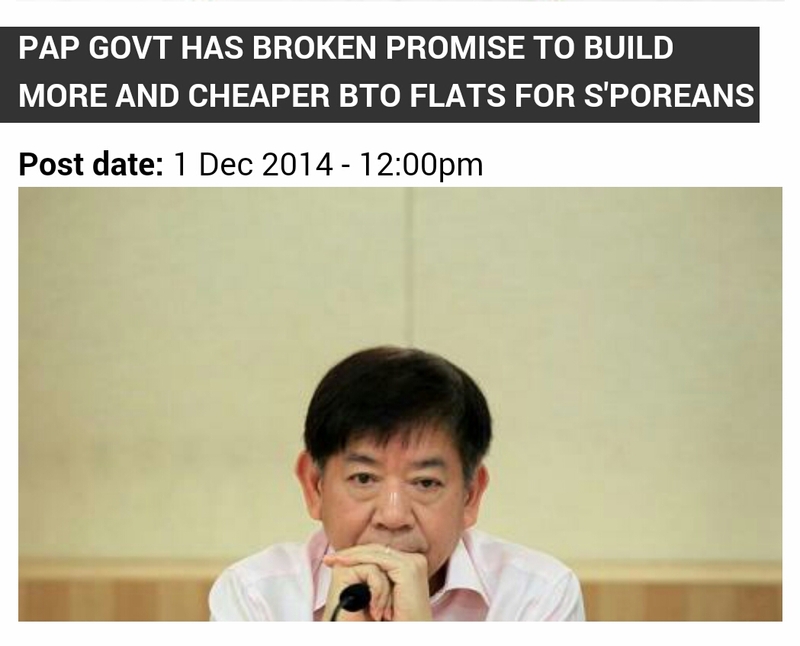 This is very different from the promise that Mr Khaw had made last year. He said that there would be 50,000 units launched this year, 54,000 next year and 63,000 in 2016. “However, in Singapore, the government continues to spend the lowest in education and healthcare, as a percentage of GDP, as compared to the other developed countries. The Singapore government also spends the lowest, as a percentage of GDP, for social protection. 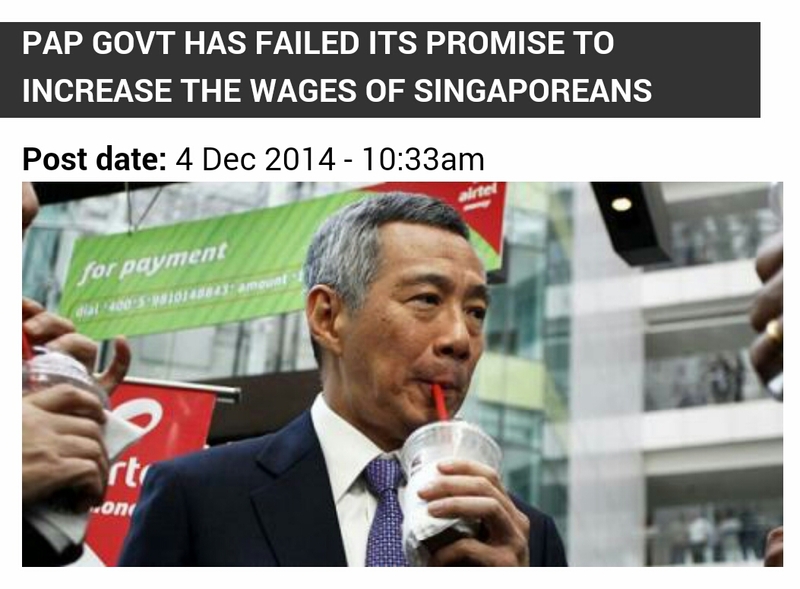 Not only that, the government has refused to define a poverty line and there is still no minimum wage in Singapore. A study by a National University of Singapore economist Tilak Abeysinghe also showed that the poorest 30 percent of Singaporean households have to spend 105 percent to 151 percent of their incomes. In short, the PAP’s “trick-down” economics do not work. Not only that, the richest 1 percent in Singapore have 14 percent of the share of income in Singapore while the richest 10 percent has 42 percent of the share of income, leaving the rest of the population to scramble for what is left. The Singapore prime minister belongs to the top 0.1 percent in Singapore. It has also been shown that every time the People’s Action Party (PAP) increased their own ministerial salaries in Singapore, the income inequality exacerbates as well. 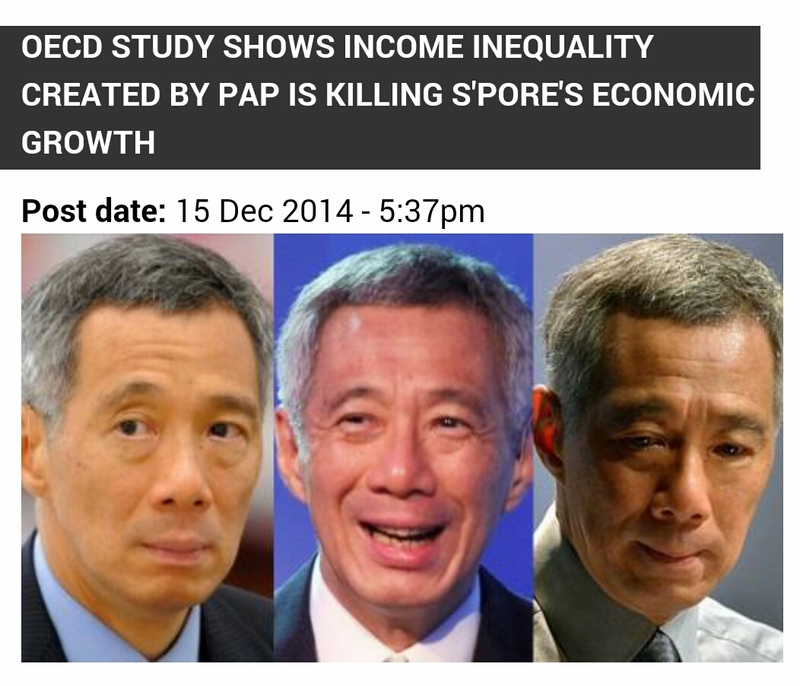 If so, it looks like the problem of income inequality in Singapore is directly created by the PAP? However, where the OECD and even the International Monetary Fund (IMF) have called for redistributive policies to reduce income inequality but where the PAP is concerned about increasing their own salaries and thereby increasing income inequality, will they be interested in reducing income inequality in Singapore and protecting Singaporeans? “But where it is clear that the PAP government is the one which has “failed” and which is not in touch with the “realities” of Singaporeans, then does the PAP government has the right to criticise its opponents when it is the PAP government which is more deserving of shame? Indeed, for a government and political party – PAP – which continues to turn a blind eye to the needs of Singaporeans and continues to resist truly helping Singaporeans, while all the time criticising Singaporeans for being ungrateful, it is the PAP government which has to reflect and “repent”. 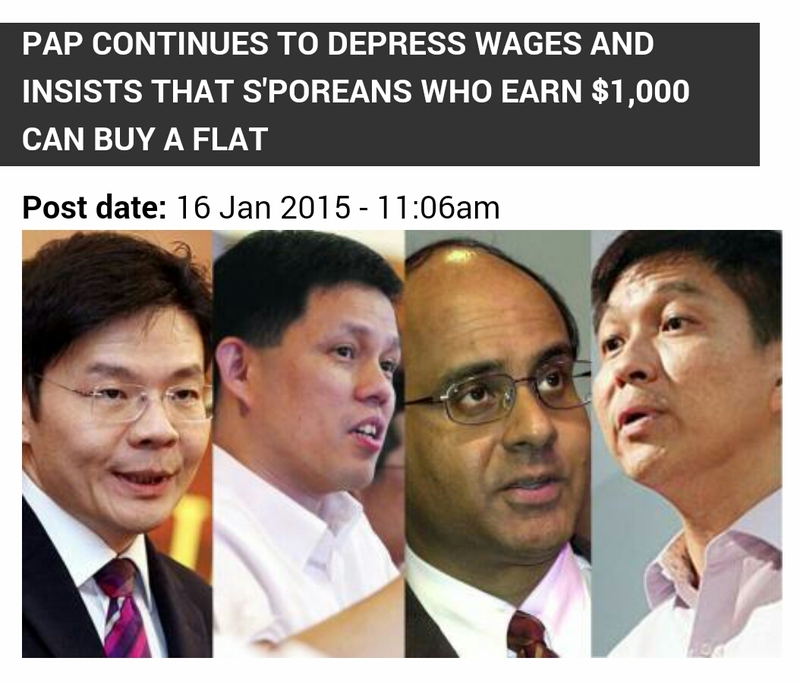 “Buy within your means,” Mr Tan said of Singaporeans looking to buy a flat. “The irony is that even as Singaporeans contribute the highest proportion of their wages into the CPF, the CPF only makes up, up to 7 percent of the main sources of retirement income of the elderly in Singapore. As such, Singaporeans are already living on very little in retirement. 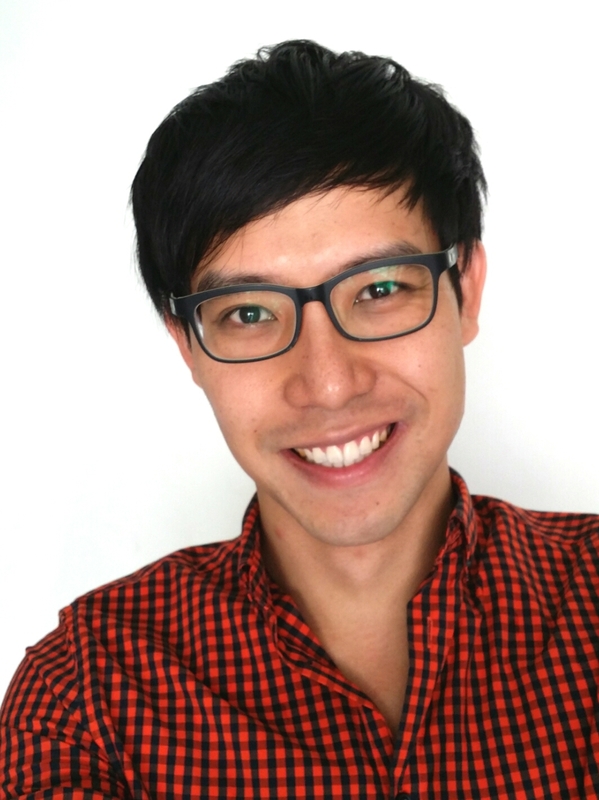 What else does Mr Lee want Singaporeans to do? To live on nothing? 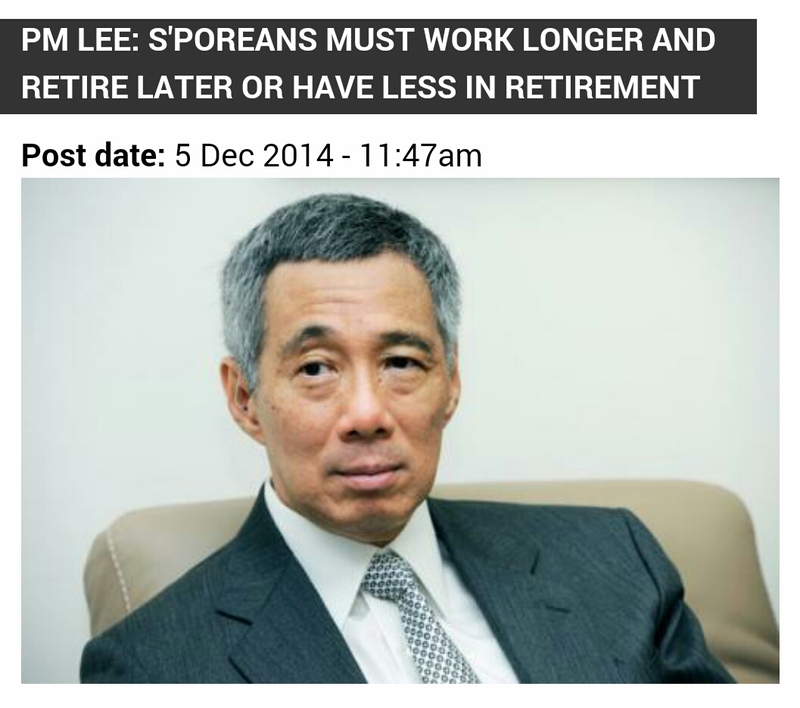 Essentially, Mr Lee leaves Singaporeans with no choice but to work longer and for many, for the rest of their lives. The basic solutions to enhancing the adequacy of Singaporeans’ retirement is to increase wages and the CPF interest rates but it is clear that the government does not want to do these because these will entail the government having to spend to give the money back to Singaporeans. Instead, the government has chosen options that would place the burden on Singaporeans instead, such as forcing Singaporeans to work longer and to carve out more of their wages into the CPF. 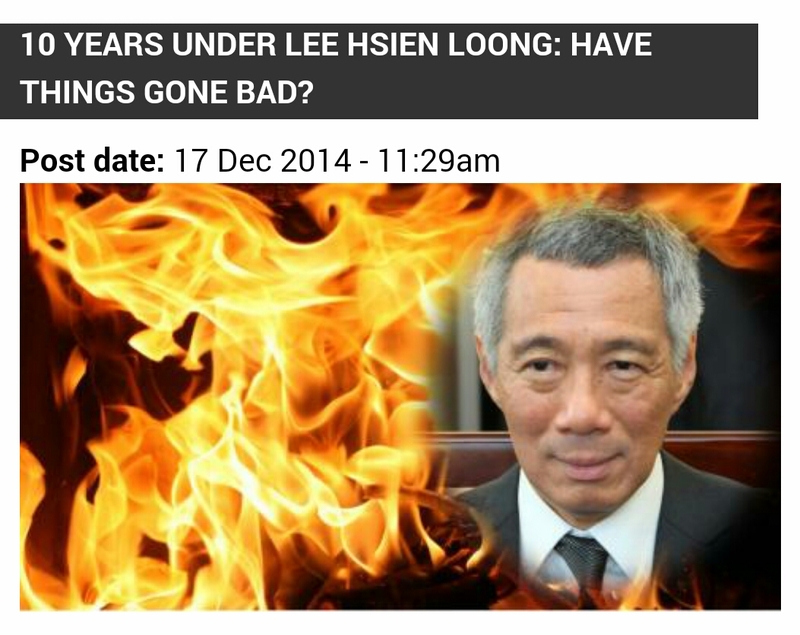 10 Years under Lee Hsien Loong: Have Things Gone Bad? “Where the PAP of the past has brought Singapore from Third World to First World in the first thirty years of Singapore, the same can no longer be said of Singapore over the past 10 to 20 years which has since lost its bearings. On the contrary, under Mr Lee Hsien Loong’s rule, Singapore might just very well see the end of its economic miracle, as it goes back from First World to the Third World, where the lives of the majority of Singaporeans become hard while only a few at the top are rich enough to live lavishly, similar to how India is. But then, even in India, where the poor is taken care of free healthcare, free education and even free housing, the poor in Singapore pales in comparison where if the poor cannot make ends meet, they will have to shoulder the blame by themselves, this where Singapore has supposedly become a rich enough country which can take care of its own citizens. Can the Opposition become the Government at the Next General Election? 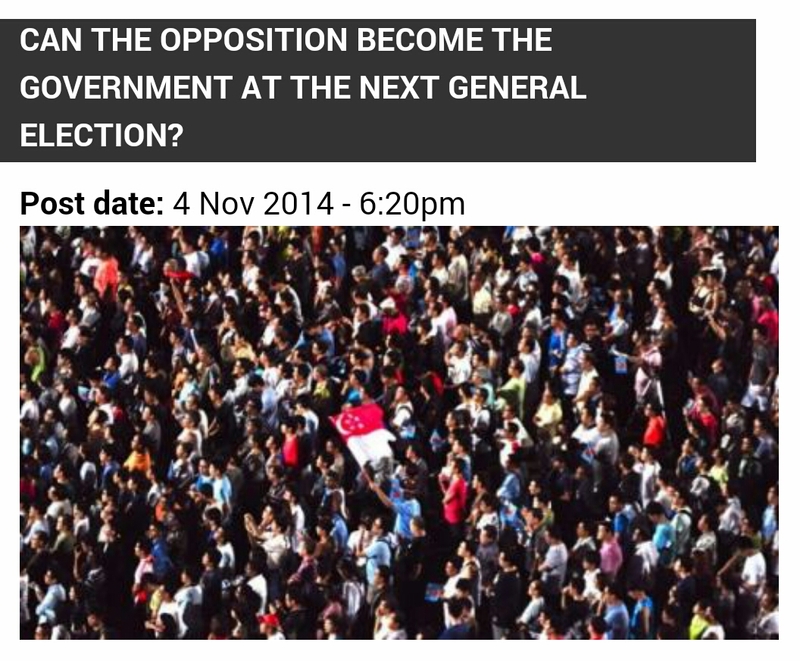 “Indeed, the next general election has been considered as the make-or-break election by many Singaporeans. At the last election, the constituencies which did not seen their electoral boundaries change due to gerrymandering by the PAP, saw their vote share increase by an average of 10 percent. The same increase of 10 percent was seen in the election prior. If this momentum is kept up, it is expected that the opposition parties would be able to see another 10 percent swing in favour of them at the next election. “The other political parties present themselves as formidable opponents to the PAP and it is obvious that the PAP sees them as threats, with Mr Lee bellowing against them so blatantly. Indeed, the next GE is seen by many observers as a make a break situation for Singapore, which also explains why the PAP is now kept on its toes – it knows that it has postponed the much needed changes for Singapore and is finally worried that its delay in resolving the issues in Singapore is now going to cost it votes. “Mr Lee had said, “The Opposition does not see any duty to bring people together, solve problems and plan for the future. 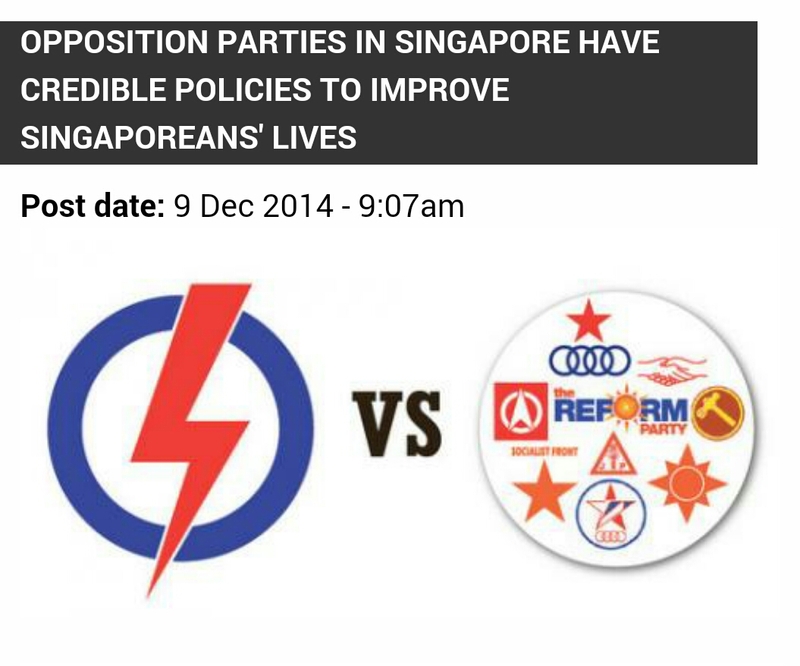 “This is untrue,” the Singapore Democratic Party (SDP) said. “The SDP published Dare To Change: An Alternative Vision for Singapore in 1994,” it said. “Dr Chee had also recently described a new vision for Singapore in an op-ed published in the Wall Street Journal. This view is echoed by the NSP. “NSP is of the view that it has a public duty to call out discrepancies and unevenness in the application of ministerial powers and discretions. Reform therefore concluded: “This could only lead any reasonable person to ask why Lee Hsien Loong is so scared of accountability? WP also said that it is aboveboard and avails itself to checks from Singaporeans. So, “yes the next GE is deadly serious for true blue Singaporeans,” SingFirst said. And “until we see the end of a dominant party Parliament, the prospect of ministerial powers being mis-applied to serve the longevity of the incumbent, remains,” NSP’s Ms Chong-Aruldoss restated. Otherwise, “Justice Delayed is Justice Denied,” Ms Chong-Aruldoss said. All your comments are about $$$. What difference does it makes? Arent you the same as PAP? All you care about is increasing salary and you want to be part of it to be on higher income and the word “Rich” repeated many times in the article. I only see Jealousy and not problem solving to help the citizens. Should the citizen trust your words or they all think the same as you? If yes, what’s the point of changing the government to a new batch then will end up the same when the principal hasnt change a bit. Rubbish. Why don’t you concentrate on the proposals and validity of the points, rather that criticize the author? What Roy says is correct. Please try and think, which I know is difficult for Singaporeans. I believe in what the author said… the government are getting less efficient, effectively and consistency.. the policies they made are to their interest but not ours.. they made too many promises but never delivered it. Its causing a big friction in big gap among the richest and the poorest.. its also affecting the productivity across all sectors whereby low income workers are struggling with their daily bread and butter effecting their productivitt.. but what the majority 70 percent does is only to vote the same governing party again and again.. have u guys learn ur lessons? So many mistakes they are making still u guys can close an eye.. i dare say the 70 percent are a bunch of sissies and cowards who dont dare to make a change.. what the government does do affect our nation growth. We used to be a nation with a strong purchasing power until our wage are suppressed whereby more so called foreign talents invade our backyards.. wake up.. all of u are highly educated dont u guys used ur common sense at all?! Are they really worthy of one over million dollars salary? What have they done? They sold almost everything away! Have they ever spoken for the people in parliament? They are parrots and Puppets. They sold PUB. SPC. POWER STATIONS. NEPTUNE ORIENT LINES. CAADS. They are good in self defence & criticised others. Look at the salaries if American president/ China president/ and all other countries salary. They are paid not more than give hundred thousands dollars. Yet their responsibility are greater than Singapore. Hmm, did you even do your basic economics? Actually what they are doing with utilities is opening them up to free market economics. Instead of holding them as nationalised institutions. When competition is introduced through the free market prices fall, which is good for us as consumers. What’s there not to love about it? What is wrong with subjecting utilities to a free market economy is that it opens the door to substantial increases as the small number of utility companies soon become a monopoly. The increased profits go to its shareholders. The reason why responsible governments retain utility provision health services and regulate transport is to ensure that consumers are not raped. Singapore with about 5 million residents is far to small to support free market utilities and health services. One can expect the PAP to promote unfettered and uncontrolled capitalism is because they are feathering their own nests – they are grossly overpaid – and they lack ability and experience. Your average PAP parliamentarian is uneducated, stupid, self-absorbed and oportunist. It is about money that things is going wrong..you dont need money to live?? Especially living in this expensive country with people who earn only $1k per months. Good work, I think it’s time Singaporeans start being proactive by questioning the system. A taxi driver uncle said to me “it’s not something to be proud of… living in the world’s most expensive city, there’s something wrong with that”. Yes I this a MUST. Mr Lee Hsien Loong reminds me of a friend’s uncle who is a compulsive gambler. He would do anything to lay his hands on whatever money to satisfy his gambling habit. If he won, he will splurge his winnings to show off how ‘rich’ he is at the expense of people who lent him the money instead of returning these money to them. This is known as VANITY. Or he will gamble more hoping to win more money. This is called GREED. And if he loses, he will think of ways to get more money to recoup the losses, including telling lies or even stealing. This is DISHONESTY. If he doesn’t get what he wants, he will get angry and become threatening and he is physically strong and powerful. Now that is ABUSE OF POWER. Even a little child can tell that our leader is using our money to invest but not returning to us. And as more and more mistakes are committed, we are made to pay for their sins. Our CPF are locked up in such a way that we can kiss our hard earned money goodbye. Now we may not even be able to buy a house using our CPF funds. The government’s excuse is to help us so that we can retire comfortably when we grow old. I see that the elderly citizens in Singapore are retiring comfortably, collecting cardboard and cleaning dining tables. For those who are not working they are retiring comfortably with a meagre sum of $600 a month. These people should have their money returned to them in full so they can travel and see the world while they are still alive and kicking and not be treated like beggars. Well I was not born yesterday and I know how to manage my own funds and I never believe in anyone doing it for me and definitely not the government. This government reminds me of a friend’s uncle who is a compulsive gambler. 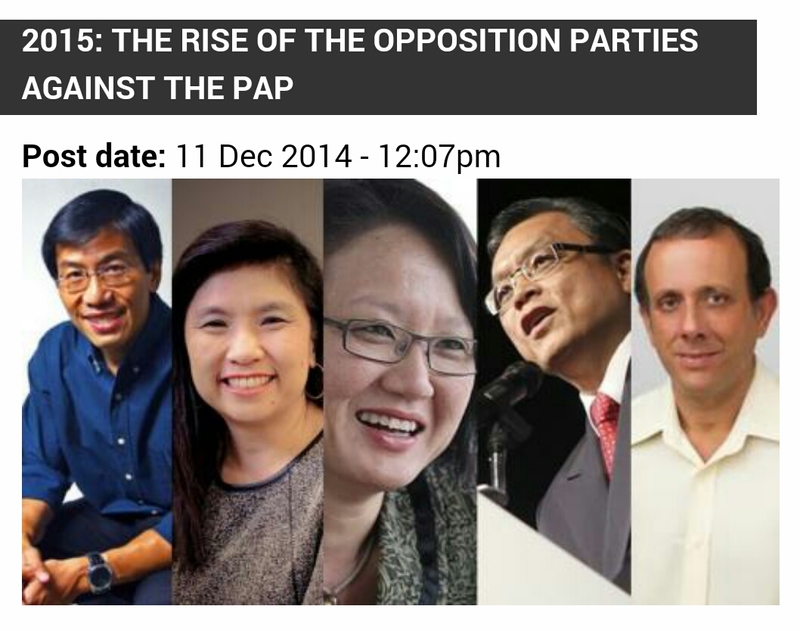 One cannot just see PAP as a political party. They have been the pillars of foundation on which this country has been built on. However, a pillar, which apparent to most, seems to be showing cracks. The current party has only pressed on past policies and adjusted them to suit the global competition, with no regards of whether singaporeans are able to meet the standards. But whats the point in complaining? If the opposition truly wants to stand up, the same pillar would either have to be fixed, or completely replaced. The latter is no simple feat. To uproot and replace all the current policies set by our government and come up with better ones(if any), it would be foolish to think such a change would not plunge the country into confusion (possible poverty) during its first few years. The former, to review, then alter and/or improve current policies set in place. It is a process that requires time, trial and error, and results would take time to show. Either way, unless an opposition is set on the above line of thought, and is able to find a way to impress on the majority that change WILL be for the better, whatever else would be just useless banter, facts that singaporeans already know. And lastly we ask ourselves – are we willing to accept changes? Not just to our livelyhoods, but also the way the world will look at us (may be good, may be bad)? Are we ready to take risks so high that it may japrodise the future of our successors? Are we currently in a state that renders us so desperate, that we need a change? Singaporeans, are we ready to change? Think hard. Very hard. PAP’s focus is on Singapore prospering as a whole, rather than taking care of each and every Singaporean. Is that a wrong approach? It is possible to spend resources to save every single person, but is that cost worth it? Do you believe in survival of the fittest? Should we be spending an inordinate amount of resources to save every single person who falls behind? It may sound cruel, but we don’t see change because majority of Singaporeans are benefiting under this system and don’t want to vote for the country’s resources being spent on the welfare of a smaller group of people. Cruel, but life is just that. Your views are appalling. The objective of western responsible governments is to provide safety nets. Furthermore, have you considered how your would define those who you leave out. You are right in one respect. The PAP is a group of self-absorbed incompetent fools that the rest of the world mocks. But that is your problem. There is no point comparing. It does not make sense to compare a prime minister to a cleaner? To lead one has to be in the top 5% percent range of the sample size. No point complaining if you are not in that category. I rather you proof you are better than the top 5% by action. Lead Singapore and our people well if you are up there one fine day. Yes.. I think we need a change. Yes.. I think we need a change. Yup! Use the one and only arsenal in your hands! VTO!! It’s the only way! Budget 2015: Which Policies for CPF, Education and Healthcare Would You Choose?